You have probably come across the words: LVP flooring or LVT flooring in your day to day activities. Did you care to ask what they mean? Well, if not, don’t worry anymore. In this article, I aim at delving into a deep discussion of the Luxury Vinyl Plank (LVP) and Luxury Vinyl Tile (LVT) flooring. They are both great options to hardwood flooring but come at a lower cost. They are made of several layers including a wear layer which protects their surfaces from damage. Luxury vinyl tile is made to duplicate the appearance of flooring options like stone and tile. Actually, modern techniques make it hard to distinguish between LVT and actual stone or tile. Nonetheless, it’s cheaper to buy and install than hardwood or stone flooring. On the other hand, luxury Vinyl Plank is designed to appear like the real hardwood. It offers a great outlook just like hardwood flooring but has the advantage of being cheaper. In addition, it comes in different colors and designs which may not be available in wood flooring. This is one of the most attractive features of luxury vinyl plank flooring. While it gives the same appearance as wood flooring, it is much cheaper to buy and install LVP. Statistics have shown that LVP costs half as much as hardwood flooring. There is no much effort involved when cleaning luxury Vinyl plank flooring. You only have to use a brush to keep off dust and wet cloth to clean off dirt from the floor. Furthermore, the floor needs little maintenance due to its durability and water-resistance. Laying down a wooden floor requires expertise and a lot of precision with no room for mistakes. 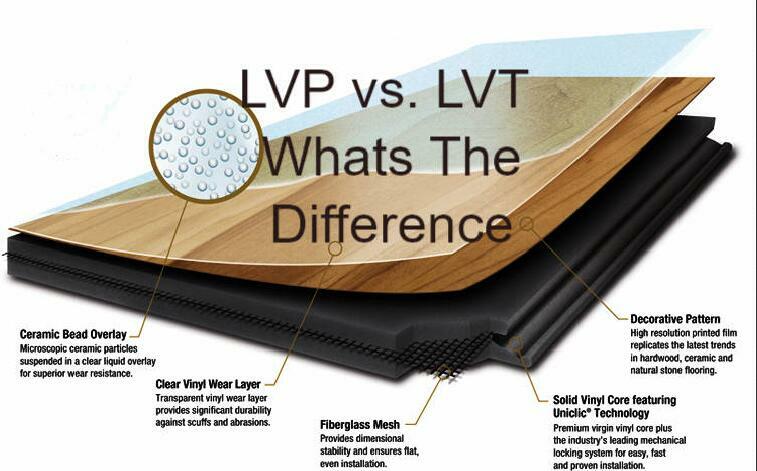 However, when it comes to installing LVP, fewer skills are needed. You only have to put the planks together while ensuring that they lock in place. In addition, you can simply use a knife to trim the planks. This makes it’s simple to install. Have you ever realized how hard it is to find various designs of wood flooring? However, LVP beats it in this aspect. You have a whole range of colors and patterns to choose from when purchasing LVP. This gives you a perfect flooring option that is flexible enough to match your furniture or walls. You definitely know how sensitive wood flooring is to scratches and water which can reduce the life span of the floor. However, this is no more a problem when you have LVP flooring. It’s much resistant to scratches made by pets or furniture. Besides, the high water resistance of the flooring makes it suitable for installation in places that are likely to be waterlogged such as bathrooms and kitchen. cold while walking on the floor. It has been shown that sunlight affects vinyl by a big measure. LVP flooring fades when exposed to much light. This is much notable in areas near a window where there is direct contact with sunlight. Therefore, you may need you to install blinds or curtains to protect the floor from fading. Vinyl is known to emit pollutant gases referred to as VOCs. The gases have been attributed to various health problems especially respiratory diseases. Therefore, if you are having a sensitive breathing system, vinyl flooring may not be the best option for you. Since most of the vinyl planks are not glued to the subfloor, they may shift or bend when heavy furniture is dragged on them. Similarly, using a wheelchair on such a floor may damage it too. You can easily afford to buy and install LVT flooring. 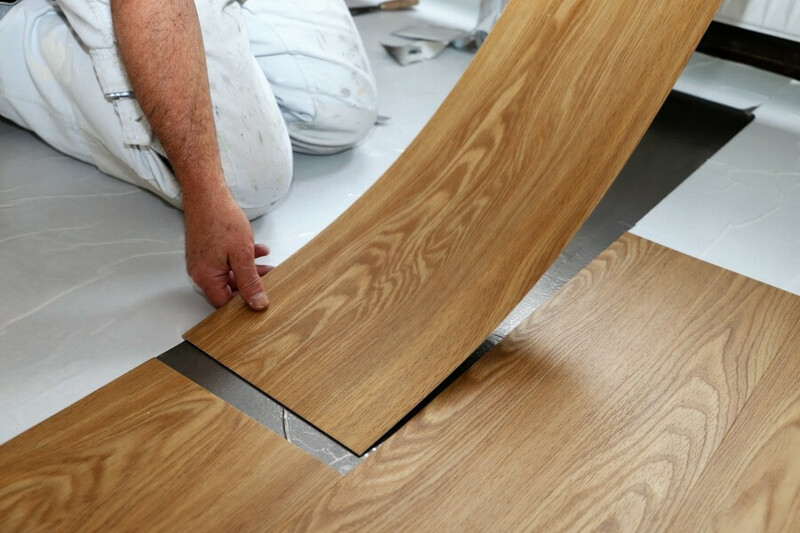 There are two methods of installing LVT. It can be done with the loose-lay floor or with the gluing method. The loose-lay method requires less preparation of the subfloor. This effectively reduces the installation time and cost. LVT has a softer surface compared to other flooring options like stone or wood. Thus, it’s more comfortable when walking on it. Besides, luxury vinyl tile is a good sound absorbent so you don’t have to worry about noises emanating from walking on the floor. Natural flooring options like stone flooring are known to have tough maintenance requirements prevent them from impairment of their look due to damage. You have to regularly sweep or clean the floor combined with constant polishing or waxing to prevent staining. However, LVT has little maintenance requirements. You don’t need to polish or wax the flooring since it has a protective layer. Buying stone or hardwood flooring is expensive. However, LVT offers a durable alternative but at a lower cost. 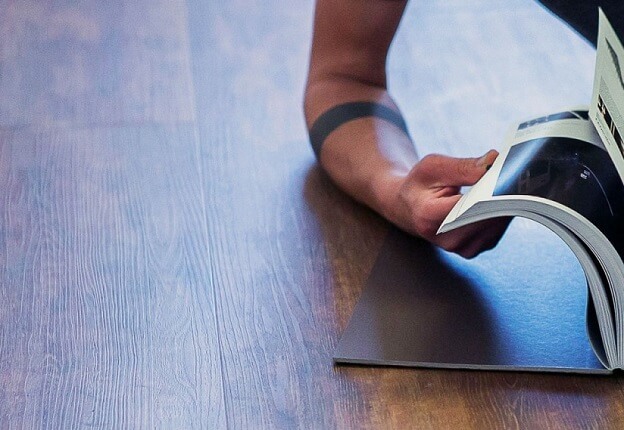 Furthermore, installing LVT require few tools and techniques. The material that is used to manufacture LVT is efficient in guarding the flooring against mishaps. Luxury vinyl tile flooring is resistant to water and thus can be installed in bathrooms, kitchen and other areas that are prone to water logging. In addition, pets like dogs and pets can hardly cause scratches on PVT flooring. Several patterns can be engraved on the vinyl tiles to mimic a stone-like or wood-like appearance. The several design options are there to accommodate the varying preferences of flooring customers. Wearing out of the pattern layer should not worry you since it’s protected by the protective film. One of the major drawbacks of LVT as far as the environment is concerned, is that it’s hard to recycle them. When disposed of, they stay in garbage dens a long as possible. This may lead to accumulation and consequently cause land pollution. Accidental water spills are very likely to happen on LVT flooring. This may cause slips and falls when someone steps on the wet floor. Unlike carpet which absorbs moisture, water remains on the surface of the LVT. In addition, carpets are good shock-absorbers when compared to LVT thus it may be more injurious to fall on an LVT floor. Harmful gases emitted by the flooring can contribute to respiratory problems. 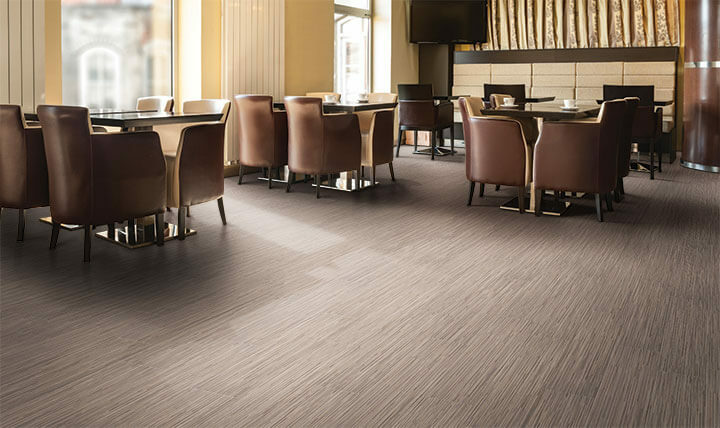 Though LVT is more comfortable than natural stone or tile flooring, the underfoot comfort level can’t match that of a carpet. Studies have shown carpets effectively reduce muscle fatigue making it more suitable for places where people walk around or stand for long periods. It has also been proved that a carpet reduces three times better than LVT flooring. If you are aiming at adding value to your home, LVT may not be the best option for you. 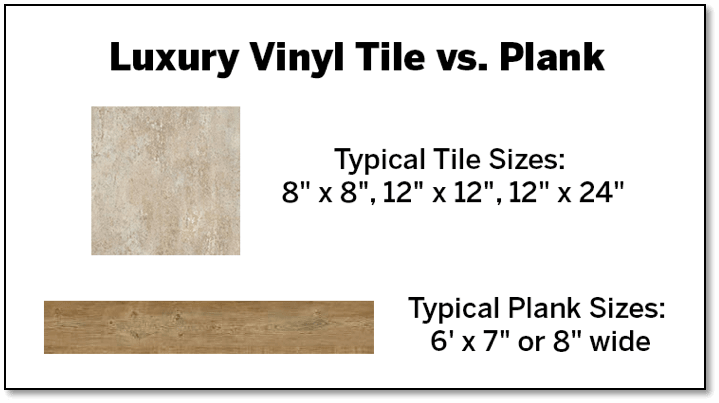 Home buyers rarely have consideration for luxury vinyl tile flooring. While the floor may look great at a glance, it may not add to the price of your home when home appraisers are assessing it. LVP and LVT flooring are excellent alternatives to hard flooring options like natural stone and hard flooring. Luxury vinyl plank flooring mimics the appearance of natural wood flooring while luxury vinyl tile flooring can be easily confused for natural stone flooring. They are both affordable and you can easily afford to purchase and install them. Besides, they are easy to maintain. However, vinyl is non-biodegradable and can cause land pollution since LVP can’t be recycled. The above-outlined pros and cons of LVT and LVP flooring can certainly help you decide which is the best for you. Also, ensure that you buy from stores that sell quality materials. A deep discussion of the Luxury Vinyl Plank (LVP) and Luxury Vinyl Tile (LVT) flooring. I have been surfing online more than 4 hours today, yet I never found any interesting article about flooring like yours. It’s very easy to find out any matter on web as compared to textbooks, as I found this floor post at this web site. I really like what you guys tend to be up too. This kind of clever work and overage! Keep up the very good works guys I’ve incorporated you guys to my personal blogroll. If there is any disapproval of this post. My partner and i don’t think so. Because I actually benefited from it. I am looking for customers to have various issues in raw wood developing. The idea of view in your content. I agree. I will share it with my customers.